Hello all, I hope everyone had a wonderful and blessed Thanksgiving! 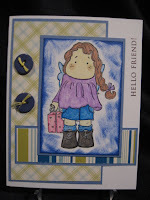 Here I have another entry into the Whiff of Joy guest Designer call. This one, Like the last one is called "Willow with lantern" I think she is absolutley gorgeous and really enjoy coloring her in. I once again used my watercolor pencils with my blender pen. I have yet to purchase any Copics, which I will be doing in the near future. So, go on over to Paper Craft Planet and check things out, On top of the Guest designer call, there are so many great ideas and some really creative and friendly people over there. Hello all, Well tonight I completed this work of art! This is the first Magnolia image that I have had and she is just too darn cute! 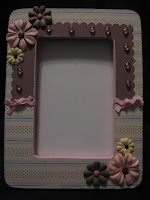 I went over to Creating with Chrissy and she has a Belli Challenge, go on over and play along she would love to have you! For this Belli challenge it was to use any past belli challenges. I Chose buttons. 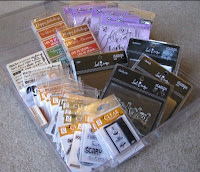 I have so many in my craft room and I keep buying them, Time to use em! So, That is what I did. I would like to use them in more creative ways, but this is all I could come up with. 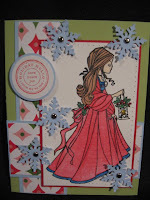 So, with that being said, I used a rub on sentiment from Stampin Up! I just love rub ons, I also have tons of those, Like I said about the buttons, I keep buying! The deco paper is also from SU! Let me know what you think and I promise to work on my photo taking skills, How embarrassing. Well hopefully I will have more to post tonight! Hugs! Wow! What fun this challenge was. 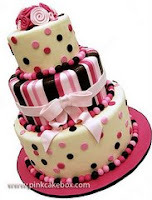 Leah'sbirthday is this month and she got the inspiration from this really cool lookin cake! Check it out, I just love it! Well The colors that we had to work with were Rose Red,Regal Rose, Close to cocoa,Pretty in Pink and Vanilla. So this is what I came up with. You cant see the sentiment too well but it says "she with the most purses wins!" 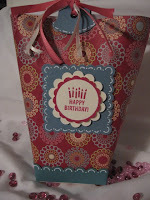 I used the purse stamp from Stamping Bella and everything else is stampin Up! Although I did use liquid pearls from Ranger Ind. and added some of the chunky glitter from Stampin Up!I also outlined the scallops with Close to cocoa. Isnt this just adorable? Come back often this week since I have the whole week off for Thanksgiving break so I will have lots to share! 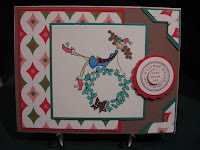 Hello all, Well I have been making my Christmas cards like crazy and having so much fun doing it! This is one that I made for BeatesWSC #67. 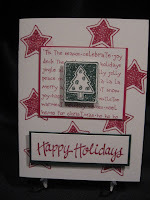 It is also the first Holiday card that I have made using Stamping Bella. My Bellas have been getting so neglected. Poor things. I have officially started my Christmas cards. I know, I am kind of late, But I do well under pressure. I really do. If I have 2 weeks to complete something, I will not even start it until 2 days before it is due. But hey, I get it done! 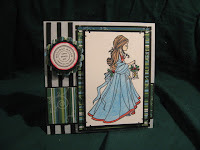 I have only made 13 cards so far and I have a variety, 3 of this, 4 of that and so on. I will probably have 50 completed by Dec. 1st. I like to have them mailed out in the first week of December. Well, I just wanted to share what I have done so far and will have more to share during the week, I am on Thanksgiving break all next week so I have lotsa time to create! Hugs! Up for some Blog candy, check these out! Hello all, I have been doing a little blog hopping and found some cool candy out there, Chceck out these sites for not only candy, but Inspiration! Thats all for tonight! More tomorrow! 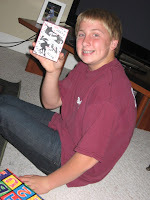 Okay, Here is Brandon with his card. He loved it! Made me feel so good, Even though when I was making it he kept coming in the room and I had to constantly cover it up. When he did open it he was like, ah ha, Thats what you were working on. Cant get anything by him. Except for one of the birthday presents I got him, Came in the mail the other day, and When the mailman got here, Brandon had to sign for it and he carried it to me and said, okay mom, more ebay? then he went on his way. I got that one by him. Oh, the gift that he signed for was an autographed numbered baker board(skateboard) Whoever Baker is, Brandon loved it! For his birthday dinner we went to Claim Jumper, if anyone has one near them, You know how big the portions are, Check out my burger, That is seriously a huge burger, ok, dont mind the open mouth, I think I took 2 bites and I was full, It was my lunch and dinner the next day. It was so yummy though! Hello, Just a quick one tonight. 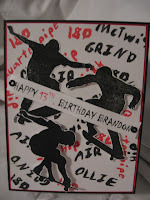 I have been working on this card for Brandon's 13th. Birthday(Nov. 13th.) for hours and I totally love how it came out. This set is so cool! It is called "Skater Dudes" from "I Brake for Stamps" This is a 19 piece stamp set and perfect for those teenagers who love to Skate! I stamped the background with some of the words that come with the set like, Ollie,Grind,Air,180, etc. I dont even know what half of them are(LOL) I then heat embossed the dudes with black craft ink and clear embossing powder. Then cut them out and arranged them just so on the white cardstock on top of the sayings. I raised 2 of the images(as you can see in the side view) and voila, a teenagers Birthday card! Let me know what you think! Well Brandon is in bed asleep and I have to decorate his bedroom door so he wakes up to a Happy Birthday since I will already have left for work when he gets up. Have a great night all and I'll be back soon! Hugs! Wow! I have a Teenager! "Olde Country Creations" she is offering some really cool candy but besides the candy, Her things are so cute, I just love the country motif! So with that being said, go on over and take a look! Happy Friday everyone. I dont know about you but I am so happy it's Friday and I have a 4 day weekend. No school on Monday for Teachers meetings and Veterans day on Tues(Dont forget to hug a veteran!) anyways, Tonight I am playing as long as I can keep my eyes open! Im blog hoppin baby! So with that being said I am going to post some Blogs that are offering some Candy! Some of them end on Sat. so get in there and post away! I will post some more later on tonight! 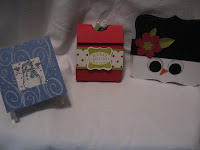 Well we made 3 projects tonight at Gina's stamp camp. I just love going to her camps. They are so inspireing! This first one is a packing tape glitter card. So easy and so darn cute. You punch your square in the card and then cut packing tape a little bit bigger than the square hole and attach the tape to the inside of the card with the sticky side out, Then you sprinkle your dazzleing diamonds over the sticky window. Then stamp your image and attach it to the inside of the card at the window facing out and voila, Glitzy glitter window! Well, I just want to tell everyone, Thanks so much for all the nice pots that I have received for my 3K Blog Candy! You all made me feel so good! 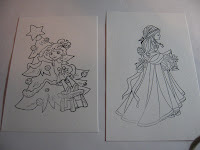 Now, first things first, I had mentioned that on top of the goodies that were shown, I was also going to include 6 surprize stampes images and here they are..... From Whiff of Joy we have 3 each of Charlotte decorating christmas tree and Willow with Lantern. Now for the winner, Using Random.org It came up with #21-Michelleso with that being said, Michelle, e-mail me your addy and I will get you your goodies, Congrats and Thanks again everyone for playing and come back often as I will be offering some more cool sweets real soon! Hugs to all my friends out there! A Frame and a challange! Hello all my cyber friends. Well it’s Saturday night and what a great day today was. I had a vary productive day. It has been raining pretty much all day today so what a perfect day to get some things done. I cleaned out the fridge,cleaned up my side of the craft room(my boyfriend has a train layout on the other half of the room) Organized scraps,went to our neighbors house and played Liars dice, Brandon even came and played. I had so much fun. It's not too often that I get to hang out with with my almost teenage son(13 on the 13th.) So I was lovein it.